Down Payment Resource rebrands and bolsters tool that brings in homebuyer leads for agents. About a year and a half ago, real estate agent Ronnie Burnham was looking for a tool that would both help him reach more homebuyers and give him an edge over other agents in his market. Ironically, he found that tool being offered at no additional cost to all the members of his MLS, the Central Virginia Regional Multiple Listing Service (CVR MLS). The tool, Down Payment Connect, was offered by Down Payment Resource, a provider of down payment assistance information. Burnham was intrigued by the offering and found that not many agents in his MLS were using it, so he signed up for a training webinar. It was the “perfect tool” for finding potential buyers in need of and eligible for down payment assistance, according to Burnham. The programs include options for first-time buyers, police officers, firefighters, schoolteachers and veterans, among others. ​Both the buyer and the home must meet certain criteria, which vary by program, he said. “Depending on the area a buyer is looking to move, there are several down payment program options,” Burnham said. He runs the Richmond Region Realty team at his brokerage, The Wilson Group. Burnham may soon have more competition in this area. Down Payment Resource rebranded its tool for its 14 MLS customers in May and bolstered it with additional training and marketing materials, which the company says has more than doubled usage of the tool. With Down Payment Connect, MLS subscribers get their own personalized link to a custom landing page that invites homebuyers to fill out a form and see if they are eligible for down payment programs in their market. Agents can add the link to their website, email signature, social media and Facebook ad campaigns, Down Payment Resource spokeswoman Tracey Shell told Inman via email. “All leads generated from their page go directly to that agent. Most agents are adding these leads to their existing CRM, drip marketing campaigns, etc.” she said. Burnham took full advantage of the tool. He purchased the domains rvadownpaymentassistance.com and rvadownpaymentresource.com and had them re-direct to his personal Down Payment Connect landing page. On his own website, he created a page dedicated to informing consumers about down payment assistance, including a video. That page links to his Down Payment Connect landing page. He’s also spent about $500 on Facebook ads promoting the tool, tailoring the ads by audience, sometimes to homebuyers in general and other times to first-time homebuyers, nurses or firefighters. He specified a salary range of $80,000 or below for the audience and ran the ads for a month at a time. “The Facebook advertisement cost that I’ve spent has resulted in a huge return on my investment,” Burnham said. In the year and a half that he’s been using the tool, Burnham estimates that he’s gathered about 175 leads from Down Payment Connect, mostly through Facebook ads. Of those leads, two have resulted in sales, with an average sales price of $195,000. “It is an effective tool. It’s working well for me,” he said. Down Payment Connect asks consumers for their name, email address and phone number before sending them program details. After submitting, consumers automatically receive a list of programs and their criteria and Burnham gets a copy of that same list, along with the consumers’ contact information. He sends the potential buyers an email saying he looks forward to working with them and then forwards their contact information to a lender to get them started on prequalifying. He admits that some of the leads provide bogus email addresses or phone numbers, but most do not. He has about 80 active leads that he’s added to a drip campaign to stay in touch throughout the year. Most aren’t ready to buy yet, though he’s connected several to his lender and they’re working on a credit rebuilding program, he said. Because of the drip campaign, “when they’re ready to buy, my name will be top of mind,” Burnham said. The powerful tool for agents and valuable service for first-time buyers got an extra boost just two months ago when Down Payment Resource revamped it. The name. Previously called Personal Marketing Tool, “Down Payment Connect has more focus on the homebuyer (and how their agent can help) and will be more engaging for prospects,” she said. DPR dashboard reorganization. “The dashboard within the MLS now has Down Payment Connect front and center. It’s a simple, fun next step in marketing down payment assistance so we made it easier for agents to find it and get started,” Shell said. More marketing help, all in one place. DPR has updated its customizable flyers and graphics and introduced training videos. The title of lead emails now reads “Down Payment Connect Contact Request.” This is “so agents understand exactly where the lead is coming from, helping them better address the buyer,” Shell said. Facebook Group. DPR has launched a new Down Payment Insiders Facebook Group. Down Payment Insiders is “designed for real estate pros who are interested in marketing ideas for reaching first-time homebuyers and understanding the latest on down payment programs. This group is now up to more than 830 members,” Shell said. Between May and July, DPC usage by the company’s MLS customers and their members has increased 109 percent compared to the period between January and April (before the rebrand), according to Shell. “The increase was based on average monthly page views of the Down Payment Connect eligibility form across all our MLS markets,” she said. “Actual leads (those who completed the search form and submitted their contact info) saw big increases, too — up 95 percent” in that same time period. She declined to share what that meant in terms of actual number of leads. 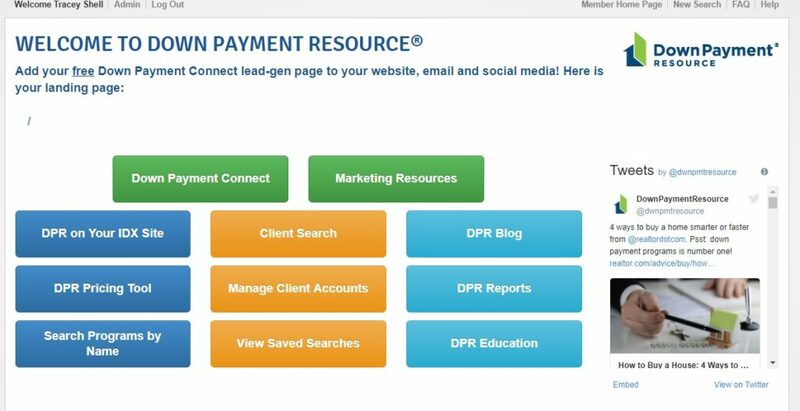 These figures do not include usage and leads for DPR’s Down Payment Connect product for individual agents. The company offers a monthly subscription for DPC to agents outside of its MLS markets at $19.95 per month, per state. “The monthly subscription is a small percentage of users right now. We aren’t heavily marketing it — just providing it as an option for agents who really want something to capture [first-time homebuyer] leads from their site. In fact, we launched it simply out of pure demand from agents in markets where we weren’t yet available,” Shell said. PUBLISHED WITH PERMISSION FROM INMAN NEWS. « Feeling stuck in your home buying journey? These success stories will inspire you.